(A) Synthesis and regeneration of 5,6,7,8-tetrahydrobiopterin (BH4), an essential cofactor of l-DOPA synthesis (scheme adapted from references 3, 11). Proteins of relevance are highlighted in red and blue. AR = aldose reductase; CR = carbonyl reductase; DHPR = dihydropteridine reductase; PCD = pterin-4α-carbinolamine reductase; TH = tyrosine hydroxylase; 2′-Oxo-TP = 1′-hydroxy-2′-oxopropyltetrahydrobiopterin; 1′Oxo-TP = 2′-hydroxy-1′-oxopropyltetrahydrobiopterin. (B) Pedigree of the investigated dopa-responsive dystonia family. 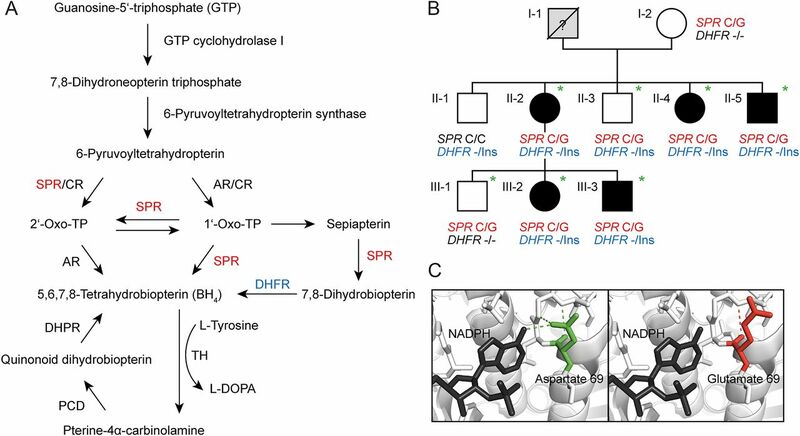 Sepiapterin reductase (SPR) C/G = chr2:73,114,768 C/G in exon 1 of SPR; dihydrofolate reductase (DHFR)-/Ins = chr5:79,950,163-/TGGCGCGTCCCGCCCAGGT (19 base-pair insert) intronic, located upstream of exon 5 of DHFR. Green asterisks indicate family members with urine sepiapterin values slightly above the concentration range measured in normal controls. (C) Structure of the NADP-binding site in chain A of SPR obtained from the Research Collaboratory for Structural Bioinformatics protein data bank (identifier = 4XWY) in wild-type (left) and mutant states (right). Aspartate on position 69 forms hydrogen bonds (green dashed lines) with cofactor nicotinamide adenine dinucleotide phosphate (NADPH) (colored in black). In the case of a substitution of aspartate with glutamate, a loss of hydrogen bonds is predicted (dashed red line).